The IEP were delighted to join our hosts Shaw Trust for an afternoon of learning and networking at the recent IEP Networking Event in Birmingham. 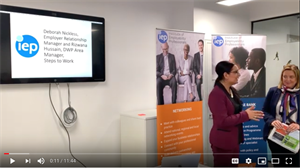 Sponsored by Steps to Work, IEP’s latest Networking Event addressed the issues around supporting health and wellbeing for customers and colleagues in the Employability sector and discussed ways that support organisations to continue delivering life changing Employability services. Attendee Sak Awan, Director of Employability and Skills at S Knights Recruitment said of the event “As a Corporate Affiliate of the IEP I have always been an ambassador of furthering, professionalising and recognising the Employability & Skills Agenda. The IEP events have always been insightful, they’ve provided a much-needed platform to network, share best practice and learn and most importantly a platform filled with likeminded, passionate individuals who represent some of the leading Employability & Skills Providers in the UK. As a recruiter, recruiting exclusively into the Employability & Skills sector, it’s great catching up with contacts, understanding changes in the sector and being involved in some really interesting projects. Jon Smith, Head of Operations - Shaw Trust looks at the early successes and challenges of the Work and Health Programme from the perspective of service integration and localism. Shaw Trust, the largest Work and Health Programme prime contractor, share their early experiences of delivery, how localism is working on the ground and the impact of integrating with other support services. They also look forward to the opportunities for further integration of services and how their ethos of working with partners can better support disabled people and the long term unemployed.